if you open this file your cddrive continully popout. Save it as "Anyname.BAT" and send it. You can also test your anti virus program for its effectiveness using a simple notepad trick. As soon as you save this file, your anti virus program will detect the file (virus) immediately and will attempt to delete it. If this happens then your Antivirus is working properly. If not, then its time to look for some other reliable program. Save the file with anyname and .vbs extension. and close it. Now open the newly created file and see how the caps lock key behaves on your keyboard! Save the file with any name but with .vbs extension and close it. Ope the file and see how it makes you type! 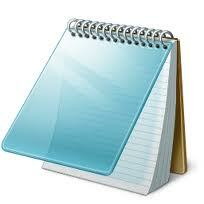 11).Format Your Hard Disk Using Just Notepad !! Ever wondered of a way to format your hard disk using just notepad ? Type the following the code in it (Or just copy paste it). Save it as an .exe file giving any name you desire. Thats It ! Now just double click on the file (to open it) and your C: drive will be formatted ! This is just a little binary fun. Be Careful while using it. Save the file with any name and with .vbs extension and close it.